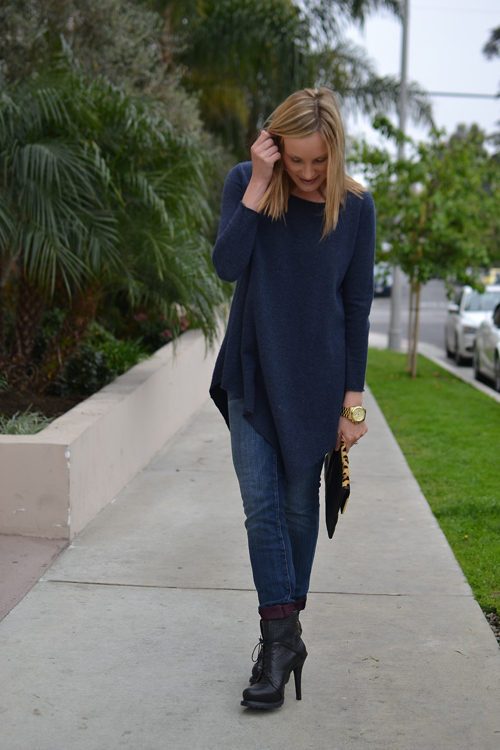 It's safe to say that I'm having a moment with denim and asymmetrical hem lines. I wore my lighter weight gray version of this sweater last week and my blue cashmere one yesterday. Yes, I'm totally that girl that buys something I love in multiple colors. Since the temps were on the cool side, I went with my edgy booties and cuffed denim for a day spent running errands. Happy Monday! You pull off these long drapey pieces so well - it makes me jealous! Those booties are AMAZING!!! great post! Ah, that sweater is amazing! My kinda look - effortless yet chic. i don't blame you for loving this asymmetrical look! it's so effortless and fab! the sweater is very cool on you! No one pulls off comfy chic quite like you! You look great! I love that sweater because it looks great with super skinny jeans and leggings. Definitely perfect for a cloudy day. totally adore this cozy chic look. I've been feeling that similar vibe! love your boots! you look lovely as usual! love those heels! Sweetie, you are looking remarkable! Your little girl is so precious - congrats again!! Those heels are absolutely smashing...love the lace up. I LOVE this sweater! It looks so comfy and cozy and I love the asymmetrical hem! Too cute! Love that clutch! The whole outfit is so chic and comfy, love it! Love this look - so comfortable and chic.